On the first Executive Council chaired by HE Saeed Abbas, the Governor or Monofeya, he directed the heads of the local units to daily oversee the work progress within the governmental departments as well as the cleanliness of cities, villages and public squares and the elimination of garbage from cities and villages to the places of assembly and the beautification of public squares. Mr Abbas also stressed the continued thorough follow-up of the elimination of all infringements in the very beginning on agricultural land and state properties, as well as the removal of all occupations from the streets in the cities and on the sidewalks for easy traffic within the city in coordination with the police facilities and to oblige all shops and cafes to install cameras to ensure security and protection. He stressed the need to coordinate with the company of drinking water and sanitation and the executives to take precautions for rains by fixing manholes problems and providing water suction motors. Furthermore, he also directed the Director of Health Affairs to coordinate with the Directorate of Veterinary Medicine and local units to monitor the bird flu virus in Monofeya and take all necessary preparations and measures in this regard to preserve the lives of citizens as well as intensify campaigns and tighten control over markets and shops of meat and poultry to ensure their validity to save citizens’ lives. The Director of the Central Administration of Water Resources and Irrigation directed to confiscate the unlicensed ferries to protect the lives of citizens, to cleanse the canals, and to pump water to irrigate the agricultural land along with the lifting of the cleansing product repeatedly from the residential block. The Director of Supply directed to provide gas stations with petrol and to control the distribution of additional gas cylinders in the villages and cities with intensified campaigns and follow-up on the bakery to ensure the specifications of bread. 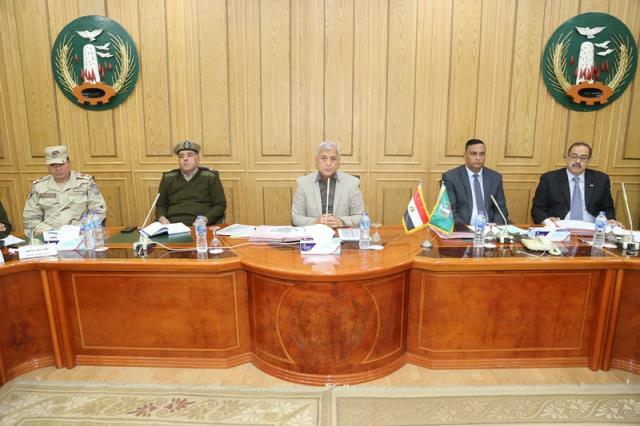 The meeting was attended by Dr. Ayman Mokhtar, Secretary General of the Governorate, Major General Alaa Yousef, Assistant Secretary General; Director of Traffic Department; Deputy Director of Security and Military Advisor; Heads of Local Units, And the Director General of the Educational Buildings Authority.